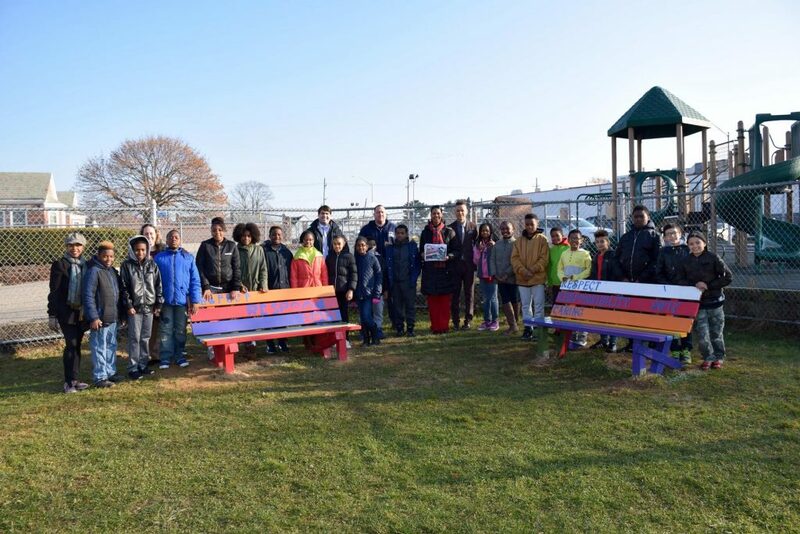 Alden Terrace School students presented the Buddy Benches they created for their school’s primary playground, intermediate playground and main field during a special presentation on Dec. 4. At the presentation, Principal Shawnée Warfield explained to parents, teachers and students that the Buddy Benches served three purposes — to show students what they could accomplish by working together, to offer the school’s children a place to sit when they’re looking for a friend to play with during recess and to provide parents with a place to sit when they’re watching their children play. The fifth- and sixth-grade students who created the benches, under the guidance of the school’s head custodian Robert Reinhardt, social worker Amy Gamrat and psychologist Donald Magnusson, also discussed the steps they took to build and design the structures, which included measuring and sawing the wood, assembling the benches and painting beautiful, unique designs. Prior to painting, each student wrote a wish on their bench, so they would forever be a part of the benches and hopefully would some day come true. Superintendent of Schools Al Harper, Director of Curriculum and Instruction Ken Rosner and Board of Education trustee Karen Taylor-Bass were also in attendance. Funding for the Buddy Benches was made possible thanks to a grant Mrs. Warfield and Ms. Gamrat secured from Lowe’s Home Improvement store.